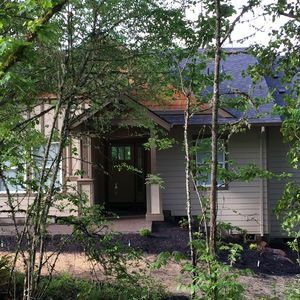 Book your Willamette Valley escape to this lavish 3-bed, 3.5-bath vacation rental house on the Boitano Cellars and Vineyards in Gaston! 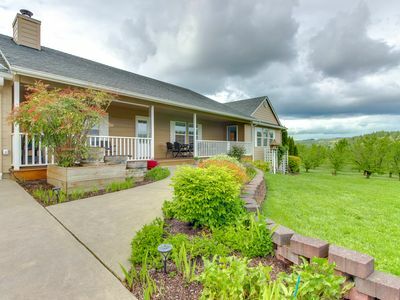 With enough space to sleep 6 wine enthusiasts, this newly built Oregon abode boasts 2,800 square feet of tastefully furnished modern interior with an on-site vineyard, gourmet kitchen, 2 fireplaces, and a deck with sweeping views of the vineyards. 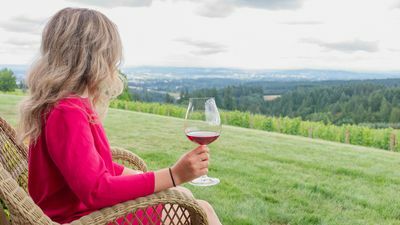 Whether you're here to sample varietals or explore downtown Portland, this is the perfect Oregon home-away-from-home. 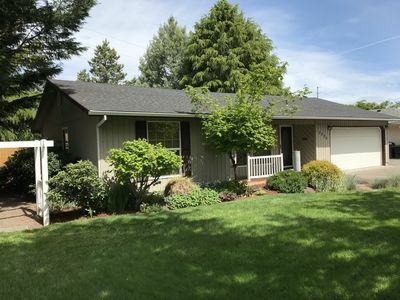 Nestled on the scenic 25-acre Boitano Cellars and Vineyards, this sophisticated Willamette Valley residence offers a clean and polished interior and is perfect for a group of close friends exploring Oregon! This home was designed by West Coast designer Larry Boitano and boasts a uniquely modern interior in a jaw-dropping Oregon country setting. 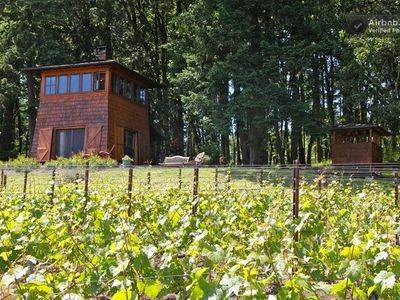 Start your morning by waking up in the middle of a Pinot Noir vineyard 500 ft above the valley floor. 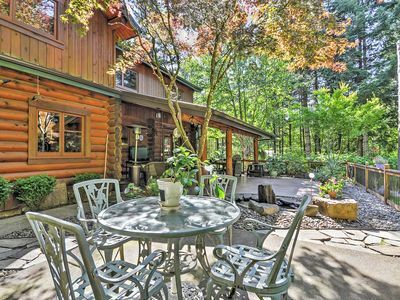 Sip a cup of hot coffee on the living room sofa as the sun rises and watch as the local Oregon vineyards come alive! 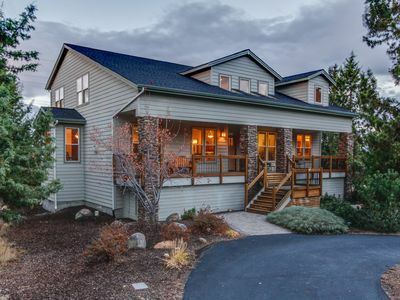 From the stacked stone gas fireplace to the massive picture frame windows and polished hardwood flooring, this home offers the ultimate level of luxury for travelers. The fully equipped gourmet kitchen boasts a professional grade stove top, stainless steel appliances, and a gorgeous tile backsplash. Uncork a bottle of wine from the wine cellar and enjoy delicious family-style meals at the dining table. If you're more of a grill master than an Iron Chef, step outside to prepare a char-grilled feast on the back deck. After a long day of exploring the local landscape, retreat to the house and keep the party alive and well on the expansive back deck. Feel free to participate in the public events held at the local vineyards or pour yourself a glass of wine and wander the picturesque rows of grapes in the backyard at sunset. 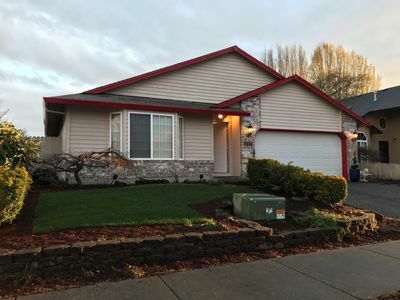 Finish off the night by watching your favorite movie on the flat-screen cable TV in the living room while the gas fireplace creates an unbeatable cozy ambiance. 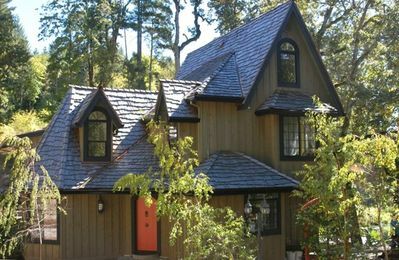 The downstairs offers a fun little deck and a wood-burning stove in case the kids want some space of their own. If you have any work to get done throughout your stay, the upstairs office makes for a perfect temporary workspace. 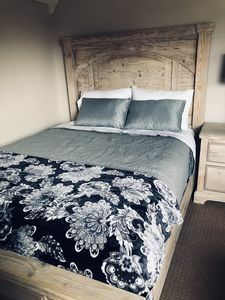 Each of the 3 comfortably furnished bedrooms has ample closet space, plush king or queen mattresses, and en-suite bathrooms for additional privacy. 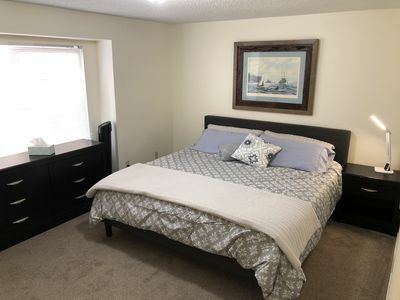 The house also has in-unit laundry machines in case you need to freshen up your outfits throughout your stay. 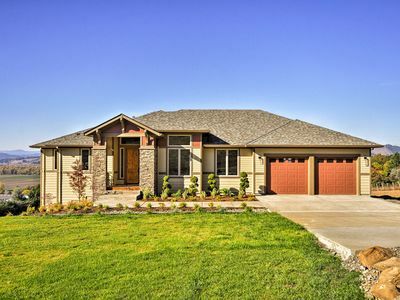 This brand new home offers the ultimate Willamette Valley wine country experience! 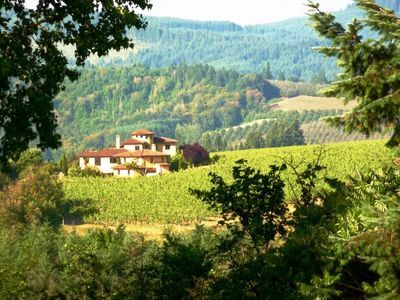 The house sits on the 25-acre Boitano Cellars and Vineyards providing unique benefits, including wine tastings and special events. 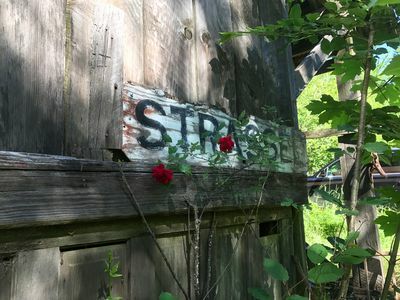 Some other notable vineyards in the area include the Soter, Ponzi, Apolloni, Dion, and A Blooming Hill Vineyards nearby. If you're in the mood to hit the beach, drive about 90 minutes to reach either Cannon Beach or Lincoln City. Cannon Beach is a bit closer to the Washington border and is known for its famed Haystack Rock while Lincoln City is further south along the West Coast! When the snow starts to fall each year, locals flock to the Timberline Lodge and Ski Area. This famous ski area is practically open year-round (closing in September for annual maintenance) and offers one of the most unique skiing opportunities one can find. There are also 5 other ski areas surrounding Mt. Hood if you want a change of scenery. 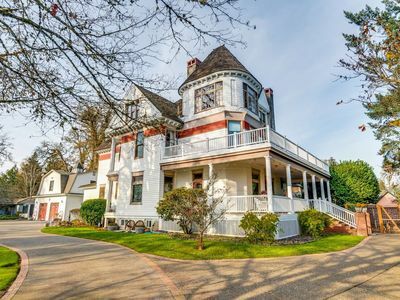 Another idea for fun includes driving about 30 minutes to explore the vineyards around Dundee, Carlton, and McMinnville. 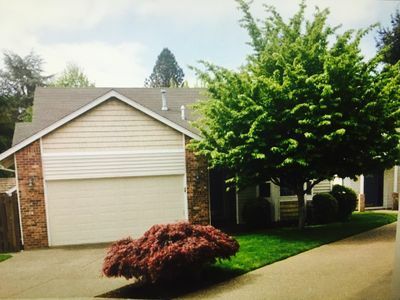 Also, this home is an hour away from the Columbia River Gorge and Hood River for summertime fun. Downtown Portland is another fun way to spend an afternoon as well! 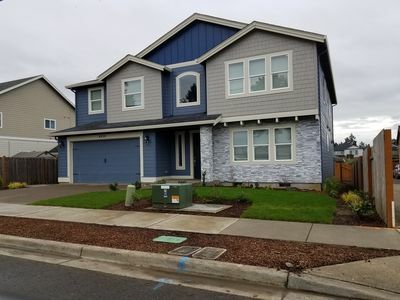 - Fantastic Gaston location - Surrounded by local Willamette Valley vineyards, 32 miles from downtown Portland, 90 minutes from both Cannon Beach and Lincoln City, 2 hours from Mt. 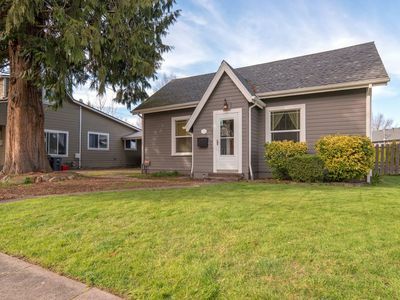 Hood, 1 hour from the Columbia River Gorge, and close to a variety of delicious local restaurants, fishing, boating, hiking, and shopping! 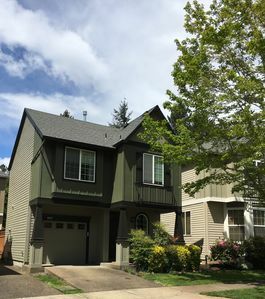 Rustic Banks Apartment w/Fireplace & Private Deck! 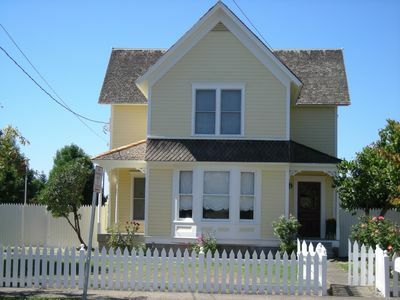 Quiet, comfortable home. Near Intel and Nike campuses.